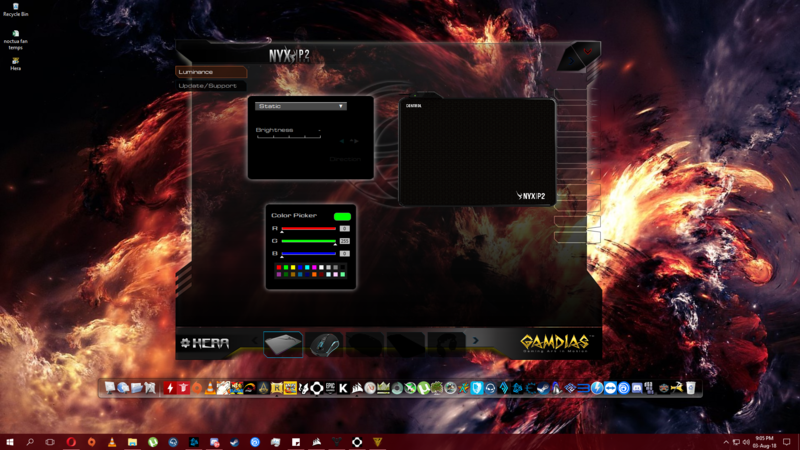 Gamdias is a relatively recent company. They were formed in 2012 and started out with keyboards and mice. Now they have expanded to cover a large variety of gaming peripherals and accessories including mouse pads, wired and wireless mice, keyboards, chairs and even PSUs. They’ve sent over several products for review. This one will focus on the Nyx P2 RGB mouse pad. Gamdias products share names with different figures in Greek mythology. Even their logo is the name of the ruler of the gods in Greek mythology, Zeus, god of thunder and lightning. And its no different with the Nyx P2. Nyx is the name of the Greek goddess of the night. 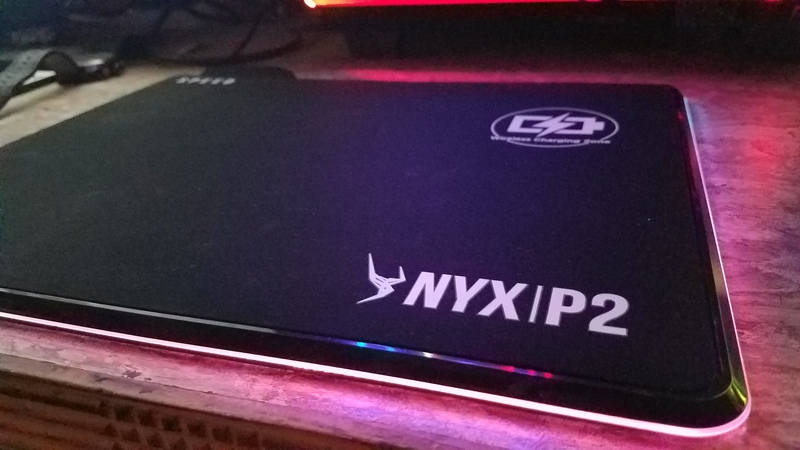 The Nyx P2 is Gamdias’ rendition of a RGB enabled gaming mousepad as is the current trend. RGB mousepads purely function to enhance the aesthetics of a gaming setup by giving you additional lighting. 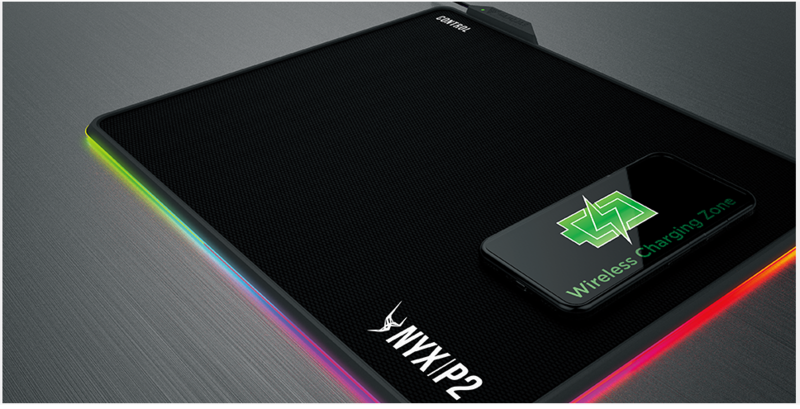 Gamdias’ Nyx P2 goes a step ahead by giving you a couple of major extra features compared to the other options on the market, a dual sided mouse surface and Qi enabled wireless charging built right into the mousepad. This is Gamdias’ first attempt at a RGB mouse pad, so let’s see how they fare and let’s get into the unboxing. 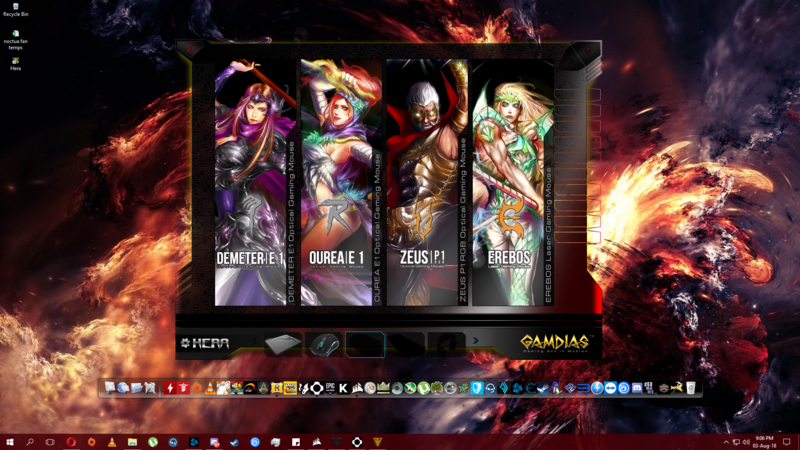 Gamdias product boxes are very straight forward. Not too flashy with in your face visuals and text and not too minimalistic. The front has all the relevant info and marketing you need to know. Company and product names in the top left, company logo in the top right. Large picture of the product itself in the center against a gray background with the highlighting features along the bottom edge of the front. This layout is common across all modern Gamdias product and they showcase the product adequately. The left and right sides of the box just have the features listed. The back has additional info in 9 languages along with the specifications of the mouse pad and various logos and bar codes. Opening the box up, we are immediately greeted by the mousepad. It comes packed with soft, thick foam to prevent any potential damage in shipping. Also there is a small USB type C adaptor that’s included in the box for plugging in the adaptor to enable wireless charging on the pad. That is pretty much everything you get in the box. Upon first look, the pad seems to be made sturdily. Most of the construction is hard plastic. The top surface on which the included cloth surface sits has a rough texture to provide grip to the cloth. The edges are made of shiny black plastic and the lower edge is made of clear plastic for the LEDs to glow through. The top left edge has a separate module that contains the indicator LED for wireless charging, USB type C port and a braided USB cable with a gold plated connector. The indicator LED doesn’t work if you dont have the adaptor plugged in for wireless charging. The charging adaptor isn’t included with the mouse pad and is a separate purchase. The entire bottom surface is made of rubber instead of small pads, which is a nice touch. This greatly reduces any slipping and sliding. Finally, lets get to the main event, the mouse pad surfaces. As stated above, the cloth pad has 2 surfaces, speed and control. 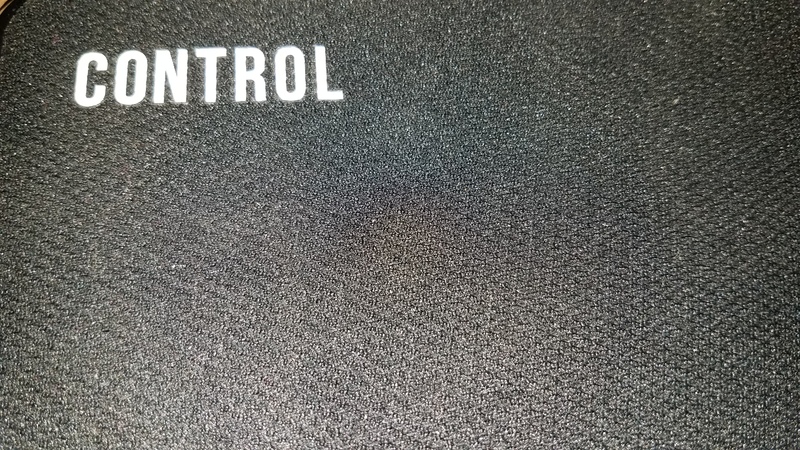 The control side is, as the name implies, slightly rougher and provide more grip when using and the speed side is much more smooth, allowing a mouse to glide more freely. The sides of the cloth are not stitched, which may result in fraying or separation but only time and use will tell. Overall, the entire package is very well presented and leaves nothing to be desired. The mouse pad unit is packaged nicely and its built very well, despite being mostly plastic. We’ll get into how it feels in actual use. The following are the features of the mouse pad as listed on the Gamdias website. The mouse pad is being tested with a Gamdias Hades RGB wireless mouse and a Logitech Proteus Spectrum G502. The associated Gamdias Hera software is used for the RGB lighting effects so I will touch on that a bit as well. Also, as we didn’t receive the additional adaptor to enable wireless charging, we couldn’t test it out. Starting off with feel. 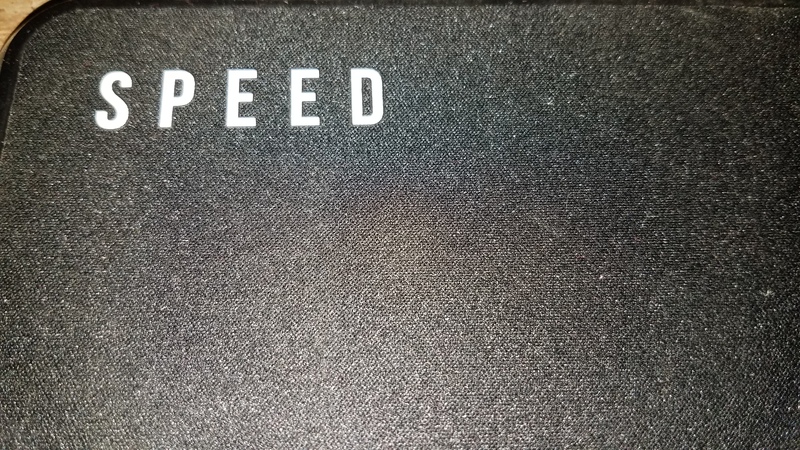 The speed surface is very smooth and sleek, good for high sensitivity users. The cloth is very uniform all over the surface. No kinks or bumps are observed out of the box. 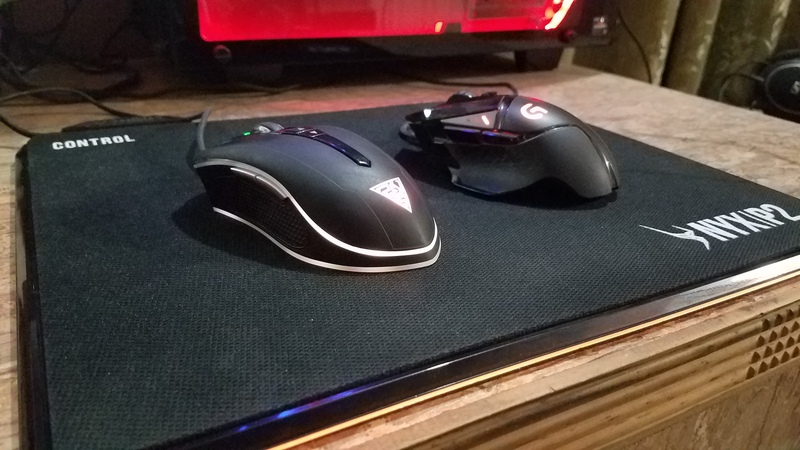 The G502 and Hades both moved very freely without getting stuck. Its not the most smooth surface but works well for how its intended to be used. I’d say low to medium sensitivity would work best on it, considering that that its a medium sized surface. Build quality isn’t bad either. Despite being plastic, the base barely flexes when force is applied. The glossy plastic rim may get microscratches with use but so far its still as shiny as it came out of the box. The indicator module on the top left of the pad is also attached very sturdily. Coming to the control side, its the polar opposite. The surface has a rough feel, with a somewhat diamond shaped pattern running over it. No unwanted bumps or kinks here either. But for some reason the control surface feels a bit lower quality compared to the speed surface. It could be the rougher texture that’s giving such a vibe. Points will not deducted for this though. The one major obvious con is that all the various logos for surface type, wireless charging and the model are stickers rather than being printed on both surfaces. This is huge problem when moving over them because the difference in friction tends to catch the glide pads and can result in erratic movement. And they cover large parts of the pad so they can be hard to avoid especially if you’re a low sens user. Hopefully Gamdius will change this in a future revision. Overall, both surfaces are really good for different uses. It is only the use of large stickers on the pad that detract from the experience. Now let’s get into the Hera software. Its required if you want to switch between the various lighting effects of the mouse pad and to control other Gamdius products if you have any. 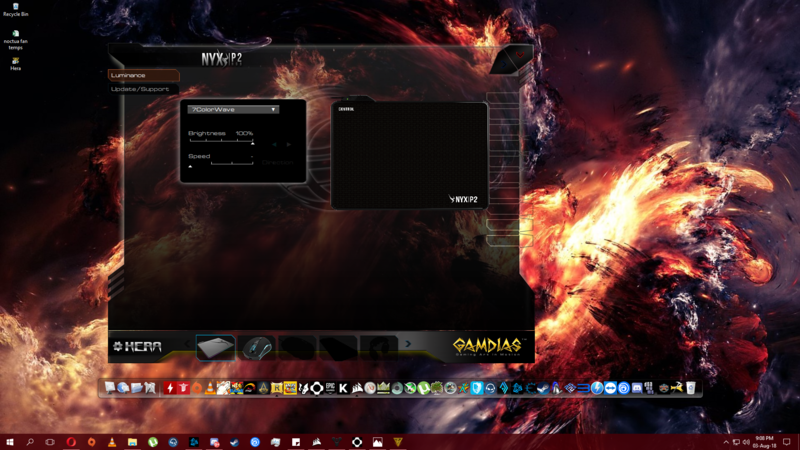 Starting the software up, we are greeted with 4 large pictures of Gamdias’ other products and connected peripherals showing up at the bottom of the windows. All supported peripherals are shown in the horizontal list with any peripherals that are plugged in appearing colored. Otherwise only their silhouette is visible. Clicking on the Nyx icon brings up a different screen, mostly blank except for 2 tabs, Luminance and Update/Support. The Luminance opens up by default. As the name suggests, this tab is used to change between the various lighting effects on the mouse pad base. Several options are possible with some allowing you to adjust the brightness, speed, direction and choice of colors. An on screen representation of the effects is also present. Unfortunately no custom effects can be made, although you get a good variety of effects to play around with. The actual lighting on the pad is decent enough, not to dim and not too bright. Colors appear vibrant and represented accurately when compared to with in the software. The lighting itself is also consistent all around the mouse pad. They could be a bit more brighter but they get the job done. All in all, the Nyx P2 is a solid option for a RGB mouse pad. A few poor design choices detract from the experience but its not all bad. Hopefully those will be improved in the next version. The Nyx P2 is Gamdias’ first attempt at a RGB mouse pad and the market doesn’t have too many to choose from. 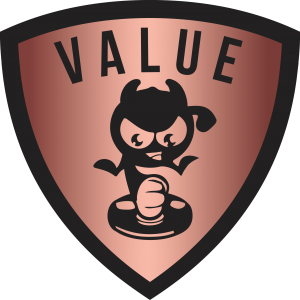 For the price, you get a feature that no other company has implemented together with swappable surfaces. Setup is very straight forward and you get the option of 2 swappable surfaces. Design is pretty sleek and clean and would go well with any setup thanks to its black body. Construction is also durable with minimal flexing or bending when force is applied so the pad is definitely built to last. Usage and lighting is also on point. The option of 2 different surfaces gives you option depending on your preference. The inclusion of built in Qi wireless charging is an added bonus which no other manufacturer has done so far. You need to purchase a separate adaptor to enable that feature. The only real downside is that both surfaces have large stickers which impede motion. Gamdias should change this to printed symbols and text instead of stickers for future revisions or provide additional cloth surfaces to with the afore mentioned change. The software also has a fair range of modes to choose from for the RGB lighting, with varying color effects and the options to set brightness, speed and direction for the listed modes. There is unfortunately no option for custom modes to be made. Hopefully this can be added in the future via software updates. So, should you buy this mouse pad? Currently its listed at $69.99 on Gamdius’ website, which is a bit on the expensive side for a mouse pad. But you’re getting customizable RGB lighting, swappable mouse surfaces and built in wireless charging. Other options in the market are also listed for about the same price, but without the option of a different surface or wireless charging. So it all comes down to preference. Keeping everything in mind, the Gamdias Nyx P2 RGB gaming mouse pad receives Tech4Gamers’ Value award. The Nyx P2 is Gamdias' first attempt at a RGB mouse pad and the market doesn't have too many to choose from. For the price, you get a feature that no other company has implemented together with swappable surfaces.